Recently I visited my cousin and her husband in Florida. While there we ate stir fry. 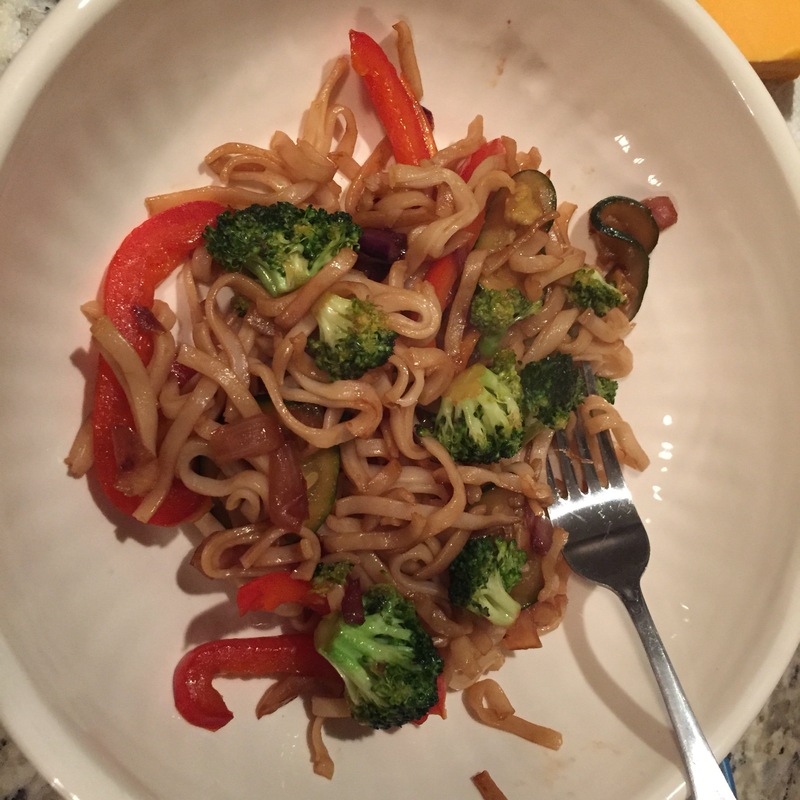 I’ve always been a fan of stir fry, but now I’m obsessed, and it’s all because of those noodles you see in there. Dayum, they’re good. So good, in fact, that I’ve had them twice in the past two weeks. I even elected to have stir fry for my birthday dinner, which is a pretty big deal. This happens to me a lot. Every time I ask my husband what he wants for dinner, he says tacos, because he knows that’s really what I want for dinner. I get hooked on a meal and eat it about once a week for an undetermined number of weeks until I get sick of it. Tacos and spaghetti have been going strong for quite some time, so who knows how long stir fry might stay in the rotation. It’s easy to make and I don’t feel guilty for eating it because it’s full of vegetables, so why not, right? This isn’t exactly an earth-shattering idea, but sometimes it’s nice just to see a picture or read a recipe that sparks an idea for dinner. What do you love to eat for dinner that’s quick, easy, and delicious? Share! On a stove set at medium heat, add oil to the wok or saute pan. Allow it to heat a little and add the onions. Cook those for a minute or two to let them soften a bit, and then add the broccoli and let cook for another couple minutes. When the broccoli starts to turn that yummy bright green color, add the peppers and zucchini. Allow the veggies to saute a little longer and then add the chili and teriyaki sauce (to taste–I don’t measure). Allow the sauces to cook in and veggies to be almost ready and add the noodles. Cook for 2-3 minutes and it’s ready! YUM. You can, of course, completely personalize this with whatever veggies and sauces you want. Hope you enjoy if you make it. I’m sure I’ll be having it again in a couple days. This week all my birthday presents to myself came in–I can’t wait to tell you about them! Sounds good going to try it!